If you are alive, then you’ve had to deal with gas. Men, women, children … even dogs and cats get gas. At some point or another, you will let out a little toot or burp, or perhaps a massive one. But sometimes excess gas will get “stuck” in the body, leading to an annoying condition known as trapped gas. It can cause pain and discomfort, and it’s generally frustrating to try and eliminate. What do you do at that point? Don’t worry; we are here to tell you all about how to get rid of trapped gas. We’ll take a look at trapped gas symptoms, how to get rid of gas pains, natural remedies for gas, and everything in between. By the time we are done, you should know how to get rid of gas through various methods. In human beings, gas can come from numerous sources, and on average, a person will create one to three pints of gas a day. Intestinal gas may accumulate from small amounts of swallowed air, or from the gases released by our gut bacteria during digestion. Normally, this is relieved in multiple ways—somewhere around 10 to 13 times a day, you will pass gas. Trapped gas is when that gas does not get passed and is stuck, usually somewhere in the stomach area. That trapped gas can lead to all sorts of unpleasantness. So, the question now turns to, what causes trapped gas? Once you know the causes of trapped gas, it becomes easier to avoid or treat. In the quest to discover how to get rid of gas pain, you must know your enemy. In this case, you’ve got to know the various things that can cause the gas to be trapped in the first place. Unfortunately, there are tons of things that can cause gas to be trapped (temporarily) within your body. As we previously noted, something as simple as swallowing a bit of air at an inopportune moment can cause gas to become trapped in your system. With that in mind, here are some of the more common causes of trapped gas. We sometimes take in air while eating or drinking. A big gulp of air going down the wrong way can get stuck in the belly. 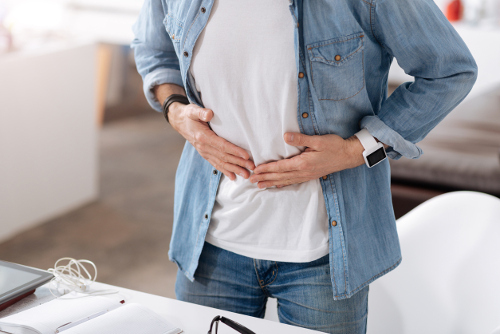 A food intolerance to things like sugar and lactose can cause excessive gas, some of which may become temporarily trapped in the gastrointestinal intestinal system. There are a number of medical conditions that can lead to excessive and trapped gas. Diabetes, ulcerative colitis, diverticulitis and Crohn’s disease are the common ailments. Due to the nature of constipation, the stoppage of bowel movements can help trap gas in your system. The symptoms of trapped gas are pretty easy to explain. When the gas becomes trapped, you may experience symptoms like excessive burping, chest pain, a bloated stomach, and abdominal pain. More than one of the symptoms tends to appear at a time. While trapped gas can create serious discomfort, there is hope as there are a number of home remedies for gas and trapped gas. Depending on what’s causing the stomach issues that are producing the gas, the simplest solution may just be a mug of warm water. It may help settle your stomach, and there is nothing in it that can upset your stomach further. It’s definitely worth a shot. Ginger has long been a part of remedies for many stomach ailments, and trapped gas is no exception. Try taking a few pieces of fresh ginger and placing them into a drinking container. Pour one cup of boiling water into the container and allow it to steep for several minutes. When the tea is cool enough, drink it. Garlic can help fix some of the bacteria issues that may be triggering the excessive gas that gets trapped. This can be done by making a garlic tea, adding garlic to some of your recipes, or even just eating a few slices of raw garlic. Garlic supplements may be able to help as well, but may take longer to take effect. Peppermint has a soothing effect on the stomach that can help to relieve issues with gas. This can be done via peppermint tea or by simply chewing on fresh peppermint leaves. Chamomile tea has a number of anti-inflammatory and antibacterial properties that can help settle the stomach, allowing the gas to dissipate. It may seem odd, but eating pumpkin can help settle the stomach. Pumpkins contain large amounts of fiber, which can help absorb any excess stomach acid as well as help with digestion as a whole. Caraway seeds can also help with gas issues. You can just bite on a few caraway seeds, or if the taste or crunch isn’t to your liking, try some crackers made out of caraway seeds. Eating a few fresh cloves can help settle gastric distress. Just take a few cloves, chew on them for a bit, and swallow them down. For many, drinking fresh buttermilk may seem like a chore, but it could help with gas issues. If the flavor is a little too much for you, try adding some powdered cumin and a pinch of salt. This one may seem a little embarrassing and uncouth, but the easiest way to trap gas is to not let it out. Holding in a burp or fart every once in a while won’t do any damage, but it may get trapped in your stomach and cause bloating. The solution is to just let it go. Be polite about it—maybe excuse yourself to the washroom, but let the gas go. You’ll feel better quickly. In addition to these, another thing to keep in mind is prevention. If there are foods that give you excessive gas, avoid those foods and the possible entrapment. Adding fiber and probiotics to your diet can also help maintain your gastrointestinal health and eliminate some issues with gas. Gas is a natural part of life. Every one of us gets gas and more than likely, everyone gets trapped gas. But it doesn’t have to be an issue. You can do a number of things to prevent it by altering aspects of your diet. If you do get trapped gas, there are a ton of simple methods that you can use to try and relieve the pressure and bloating without having to resort to medications or pharmaceuticals. Hopefully, the next time a burp gets trapped on the inside, you will know how to deal with it. “Trapped Gas,” Bye Bye Doctor, http://byebyedoctor.com/trapped-gas/, last accessed June 14, 2017. Surekha, “Trapped Gas – Causes, Symptoms, Treatment,” Diseases Pictures, December 9, 2012, last updated December 22, 2016; http://diseasespictures.com/trapped-gas/, last accessed June 14, 2017. “30 Effective Home Remedies for Relieving Gas,” Home Remedy Shop, November 20, 2013; https://homeremedyshop.com/30-effective-home-remedies-for-relieving-gas/, last accessed June 14, 2017. “What Causes Trapped Gas Pain or Trapped Wind & Remedies to Get Rid of it?” ePain Assist; https://www.epainassist.com/abdominal-pain/what-causes-trapped-gas-pain-or-trapped-wind-and-remedies-to-get-rid-of-it, last accessed June 14, 2017. “12 Ways to Get Rid of Gas & Bloating,” Everyday Roots; http://everydayroots.com/gas-remedies, last accessed June 14, 2017.